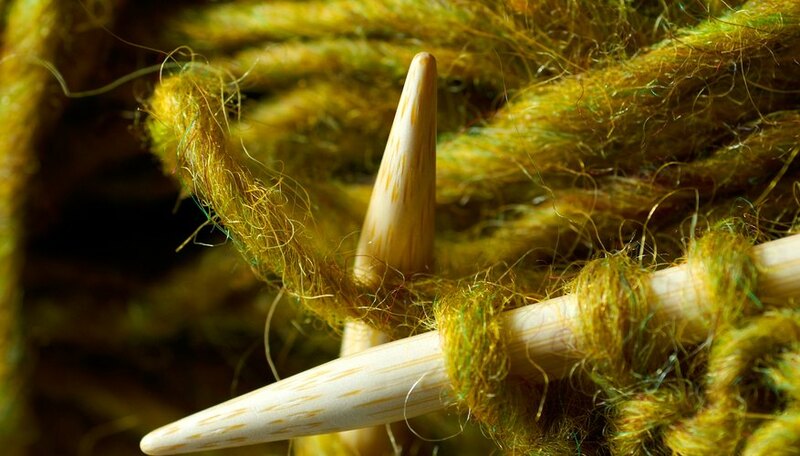 An I-Cord bind off or edging gives the finished edge of your project a smooth, neat look. This technique prevents projects in stockinette stitch from curling and creates a stronger edging that gives body to the edges. An I-cord bind off finishes just the unfinished edge of the project while an i-cord edging will create a uniform finished edge around the entire project. You can use both techniques on the same project or finish the working edge in another way and then add the i-cord binding afterward. This technique requires a working knowledge of basic knitting stitches and cast on methods. Use the cable cast on method to cast on three stitches. Knit two together through the back loop. To do this, insert your right needle into the next two stitches on the left needle behind the left needle, wrap the yarn around the right needle tip and pull it through both stitches. Slip all three stitches you've just completed back to the left needle. Pull the yarn tight and repeat the pattern (knit two, knit two together through the back loop, slip the stitches back onto the left needle) until you reach the end of the project. Cast on three stitches on a spare needle. Pick up twenty stitches along the edge of the project with a circular needle. Slide the stitches all the way around until they are positioned at the other edge of the needle so you can knit them. Slide the cast on stitches from your spare needle onto the circular needle so that they are the three stitches you'll knit first. Knit two together through the back loop. Alternately, you can use the slip stitch knit technique. The point is to use a two stitch decrease technique. Slide the three stitches back onto the left needle. Continue in this pattern (knit two, decrease over two with the knit two together or slip stitch knit technique, slip the stitches back onto the left needle) until you run out of stitches. Pick up more stitches along the edge of your project with the free end of the circular needle, from left to right. Alternately, you can slide the knitted stitches back toward the other end of the needle and continue to pick up stitches from right to left. When you've picked up another twenty or so stitches, slide the stitches back toward the other end to continue knitting them. Continue to work along all the edges of your project until you end up back where you started. Sew the seam between the beginning and end of the I-Cord edging together with a tapestry needle to finish. If you use the knit two together technique, the work may pucker in spots. If it does, replace every third or forth knit two together through the back loop with a knit three together through the back loop. Use a contrasting yarn for the I-cord edging for a pop of color. How Do You Do a Blanket Stitch in Knitting?